Review written by and copyright: Rick Curzon (21st February 2018). Lucio Fulci co-writes, directs and stars in this Italian horror. Dr. Lucio Fulci (Fulci), a horror film director, begins to be plagued by visions of his gory films. Fantasy and reality blur as the film-maker starts to believe he may be a killer. After discovering his neighbour Professor Egon Swharz (David L. Thompson) is a psychiatrist, Fulci seeks his help to discover if he really is a blood-soaked murderer or whether his movies have finally driven him insane. Lucio Fulci’s 8½ (1963); a ragged, low budget, postmodern, seriocomic, 16mm-shot horror film in which Fulci plays a version of himself slowly having a breakdown. Recommended for those with very strong stomachs. The visions Fulici has are clips from a couple of his then recent films: The Ghosts of Sodom and Touch of Death (both 1988). Footage from other movies made by the same studio are also used: Bloody Psycho, Massacre, The Murder Secret (all 1989) and Hansel and Gretel (1990). Composer Fabio Frizzi also snatches a couple of cues from his classic score to Fulci’s The Beyond (1981). This is one blackly comic, nutty movie; a crude but entertaining work that rather amusingly uses Edvard Grieg’s “In the Hall of the Mountain King (Peer Gynt)” at opportune moments. At this point in his career Fulci was finding it increasingly hard to find decent funding for his films; this being a problem across the whole of the Italian film industry. Cat in the Brain was conceived as a patchwork effort designed to use clips from other films and as such visually it has always been rough. The new material is shot on 16mm film and that coupled with a harried production schedule and a budget of about tuppence means that there’s only much that can be done with the source. I assume that this uses the same excellent master created for the US Grindhouse BD and is of comparable quality. Both discs afford the film a BD50 and a decent bitrate although it’s a bit lower here as it shares the disc with a chunky HD extra. Grain is ever present and is most welcome; this is an extremely film like presentation and the encoding is well up to the challenge. Owing to the 16mm format and low budget black crush is frequent in many shots but that was the case on the Grindhouse disc as well. Apart from that black levels are deep and rich. There are no digital artefacts that I can see and no signs of any print damage, nor any kind of digital enhancements such as DNR. Obviously, with the patchwork nature of the film when the material taken from other, earlier 16mm productions is dropped in the quality does vary. This is a genuine, pristine, grindhouse presentation; meaning that the film looked like a dog’s dinner when minty fresh back in 1990 and that look has been faithfully reproduced here. Another topnotch transfer from 88 Films; well done girls and boys! The sound is also a faithful reproduction of the original 1.0 mono track spread to 2.0 for some balance. It’s typical of a low budget Italian production of the period. The dubbing is generally well done and dialogue is also nice and clear with Fabio Frizzi’s fine score never intruding. However, there is a slight muffled quality to the English track when compare to the Italian. It’s not enough to ruin the experience though. The Italian track has the score noticeably louder when compared aide by side and is a more pleasing listening experience because of this and due to the muffling mentioned above. Although the film was shot predominantly in English; the language that matches the lips the most. Excellent discussion of late period Fulci with Mikel J. Koven (Academic, University of Manchester), Callum Waddell (film journalist), Kim Newman (author and critic), Allan Bryce (editor of The Dark Side magazine) and Antonio Tentori (screenwriter on Cat in the Brain). The general feeling is that Fulci was a solid journeyman director; he described himself as an artisan and not an artist, so I believe he’d be happy with that assessment. Most of his key earlier films get a mention as well as other productions that were shaping the cinematic landscape that Fulci was working in. All of his later, more contentious films get a plug except for Voices from Beyond (1991) which in my view was nearly as good as his prime period material; an oversight. By the way Mikel, I loved Sleepless (2000) as well; one of Argento’s best of the last twenty years! An excerpt from Frizzi’s recent US tour in which he and his bad play the Cat in the Brain score. I wanted more; perhaps the whole concert could be included as a extra on a future 88 Films disc, or as it’s own release? Ultra cheesy, English language trailer. A choice of the same cover art but with either English or Italian titling. 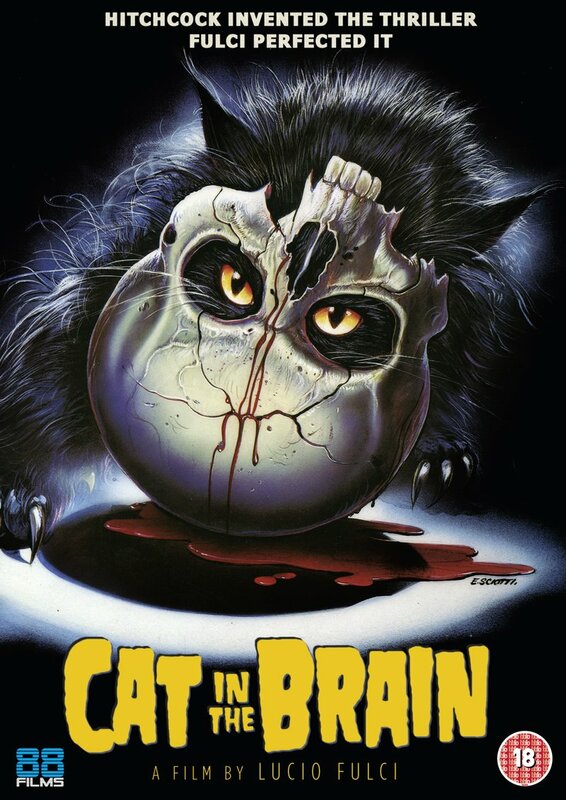 A lovely tribute to Fulci, packaged with a review of Cat in the Brain and including some quotes from screenwriter Antonio Trentori. Waddell has an obvious love of Fulci and his films and this comes through on every line of this short tribute. 88 Films have produced a splendid release for the UK market that wisely doesn’t duplicate any of the extensive extras found in the elaborate US Grindhouse BD. They’ve cunningly provided Fulci fans with a must-have new documentary about the maestro’s latter career that sits side by side with their equally good feature-length documentary Aenigma: Fulci in the ‘80s found on their excellent BD of ... Aenigma. Picture and sound quality are comparable to - possibly a shade better than - the US disc and excellent given the massively problematic source material. There is a certain bargain basement, grindhouse aesthetic to Fulci’s late period films that lets that stand on their own. As Mikel J. Koven says in the documentary the ideas were there and were arguably as good as any to appear in a Fulci film, but he was working under such terrible constraints. Now that companies like 88 Films are making these generally unloved films available in pristine versions (well, as, pristine as the source elements will allow) perhaps they’ll gain an inch or two more respect? Ok, 88 Films when are we getting a definitive special edition of Voices from Beyond (1991)?